It's another Friday. Looks like we made it... Damnit now I have that Barry Manillow song in my head. o.0 Augh!!!! Now I have to play ot to get it out of my head. Yes Dave, you can look at me weird. Even I question how I have his music on my computer.... either way Looks like we made it!!!!!!!!!! 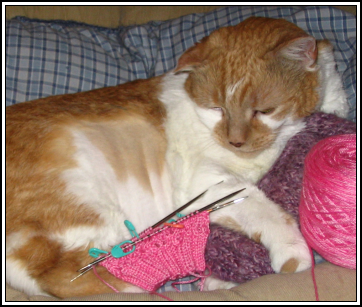 put the newest sock I'm knitting on the cat to help me document her cuteness. I then put the sock on her head, cause that's how I roll. Did you notice in that second picture that her tummy is shaved. Yeah the fur on my pillow/lungs was becoming too much. I only shaved the sheddy parts she won't let me groom. The rest she's fine having brushed but brushing the tummy is a major no no. Oddly she's okay to have it shaved. Lovesssss the extra snuggles. I swear that cat would live on snuggles 24 hours a day if she could. She really likes to get cuddles when I'm asleep. This severely interrupts my sleep, but what the heck and I supposed to do. I can't say no to an aging kitty. I'm lucky for every moment with her... even the annoying ones that wake me up. This morning she woke me up by licking my eyelids. Lemme tell ya it only takes one eyelid lick to wake a person up all the way. o.0 Still I loves me this kitty muchly. The sock I've just started knitting is with Dave's Cabin Cove Yarn in and the pattern Hourglass Eyelet Socks from Magknits. 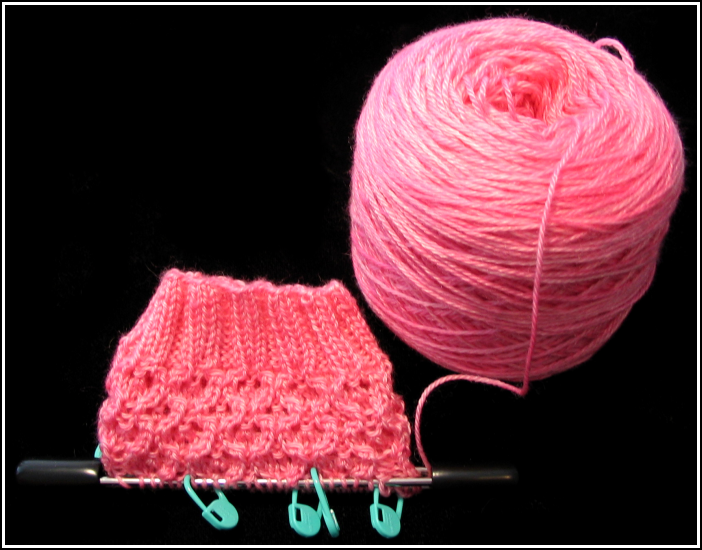 I'm doing the sock on DPN's as I wanna do it that way instead of the circs. I'll try that someday. I just didn't have the needles and I really just wanted to do it on DPN's. The above pictures show the color of the yarn better. This stuff is glossy and gorgeous to work with. :D I took this close up without flash to show off the pattern so you could see what it looked like. I printed the pattern for the socks out...fooling myself that I might actually make them. 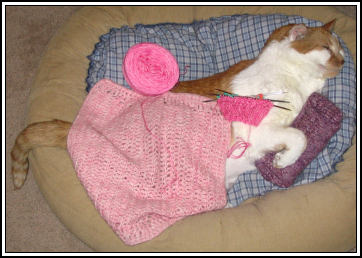 I have some pink Dave yarn that would be great. Sure..just what I need..one more WIP! Cute Kitty! So, was he messing with your mind or was your kitty doing it for him? The bottom photo is SOpretty with that knit sticth. PRETTY. I can't believe the kitty let you do that. The sock is looking great. The kitty is so cute I can hardly stand it. 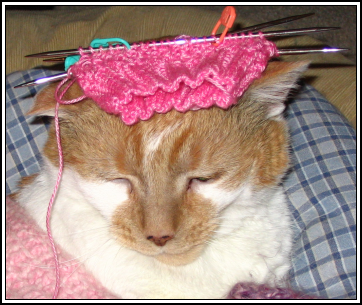 You should send the one with the sock on her head to stuffonmycat.com!!! Love that pattern and color on your socks, too!